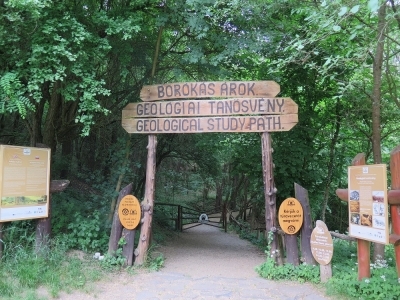 The Ipolytartnóc Fossils is part of the Tentative list of Hungary in order to qualify for inclusion in the World Heritage List. Giant petrified trees! This site apparently doesn't have much chance of becoming WHS but I nevertheless found it interesting, enjoyable and something special to visit. It is probably not the most unique place in the world where traces of ancient forest can be seen by just stepping a few hundred meters off the "ordinary track". The site is easy enough to find by car and had a few visitors, especially one big school group enjoying the large playground.Going into the special area is only by guided tour which requires 4 guests minimum and would go every hour and a half. To pass the time you can go to the rock park which was aimed at really young kids, and if you have enough time to hike in the forests nearby and you don't mind peaks then you can easily spend a whole day here. Whereas I wouldn't go out of my way to visit I found it was a good few hours of forest air and interesting info about the "Prehistoric Pompeii" covered by volcanic rocks.